The Vampire Academy series is one of my favorite series. 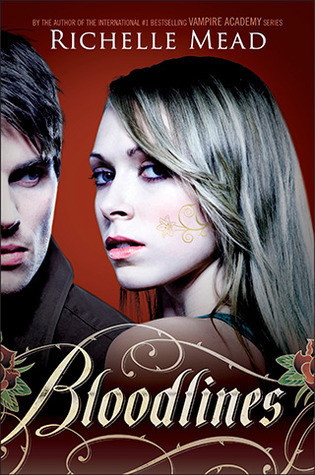 Richelle Mead creates such superb characters and fantasy worlds. I won an ARC of this from another blog a month ago, but I still haven't received it, which makes me think that it's not actually coming. I don't know if that's the blogger's fault or if the book got lost in the mail, but either way, it just makes me anticipate Bloodlines more. Who isn't waiting for Bloodlines? ahaha, great pick! Aww, bummer about the ARC. Hopefully it'll show up, but if not, August is just around the corner! I'm definitely looking forward to this one too. I need more Adrian in my life. I can't wait for this one! a great pick. I am excited to start this new series too. It sounds amazing. Great pick! Excellent pick. I haven't read The Vampire Academy. I know, shame on me, but I really want to start this new series. ;) Looks so good. Major bummer about the ARC! I loved the VA series so I'm definitely looking forward to this one. Should be a great read! Great choice! I cant wait for this book either! I loved VA soooo much! I spotlighted this a fwe weeks ago! Here’s mine this week: WOW. Happy Reading! Just one more month to wait! Can't wait to re-visit with the VA World. this looks like an awesome read! I really need to check this one out! Have to finish the VA series before this comes out.